Counter is simple one button tool ™ mobile application to count anything or everything. You can use the application absolutely free. Stopwatch is small and easy to use stopwatch timer for Android with Resume and Continue features, works even after device restart due to power lose or system update. You can install and use application on any Android device absolutely free. Missing Buttons is a try before you buy software. Allows the user to perform useful but hidden tasks, such as: turn off monitor, emulate Ctrl+Alt+Del combination, Sleep notebook without closing the lid, and many others. Software costs just $9.95 USD, but you can download and evaluate the program for free. Caps Lock Indicator appears on many requests by different Keyboard LEDs users. Program shows state of Caps Lock in the system tray and over the desktop. There are different sound notifications when lock is turning On and Off. Software is a Try Before You Buy (shareware) product just for $9.95 USD. You can download and evaluate software before actual purchasing. 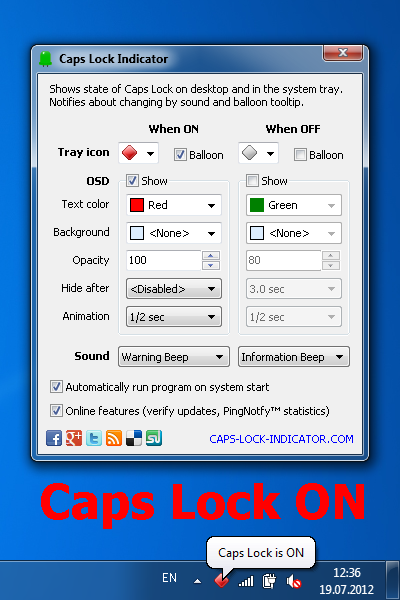 Num Lock Indicator appears as compementary to Caps Lock Indicator software. 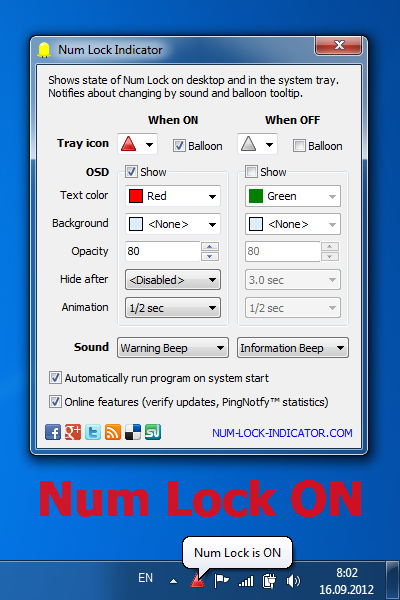 Program shows state of Num Lock in the system tray and over the desktop, also it notifies about Num Lock changing with sound alarms. Software is distributed as Try Before You Buy for $4.95 USD. You can download and evaluate program before purchasing. Scroll Lock Indicator appears as compementary to Caps Lock Indicator software. 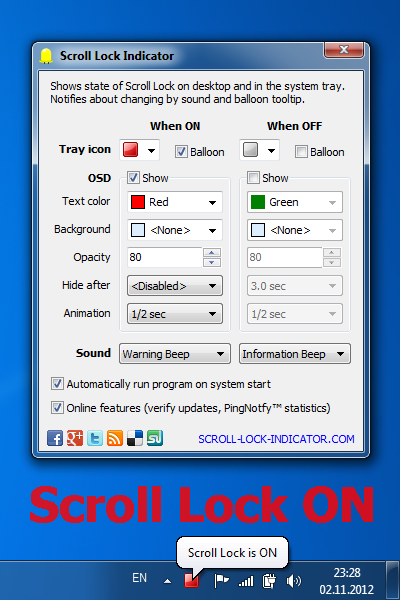 Program shows state of Scroll Lock in the system tray and over the desktop, also it notifies about Scroll Lock changing with sound alarms. Software is distributed as Try Before You Buy for $2.95 USD. You can download and evaluate program before purchasing. Keyboard LEDs is one of Created Just for Fun™ software utilities. I've created this software because my notebook has indicator for caps lock under my right palm. Moreover, my new netbook has no keyboard indicators at all! Program shows states of keyboard switches in system tray and over the desktop. Also you can switch any keyboard lock using a mouse, and customize appearance of indicators and program behavior. Software is free. Touchpad Blocker is one of Created Just for Fun™ software utilities. I've created this program because my netbook has a very sensitive touchpad so cursor jumps to different place when I accidentally touch the touchpad by a palm. It was insane to type a text when I've been lying in the bad. Program solves this problem by disabling some mouse events during a small period if any button on the keyboard has been pressed. You can customize the delay and keyboard shortcut to disable blocking, when playing games for example. This program is a must have tool for every notebook with touchpad. Software is free. Auto Mute is one of Created Just for Fun™ software utilities. I've created this program because I hate when my notebook produces a loud sound when I open it at conferences, on public meetings, or at home when children already sleep. Software makes computer silent on logoff, suspend or sleep, so the next system start is absolutely quiet. I don't understand why such feature is not integrated into operation system. But now you can download and use this sound mute control program to make your computer quiet in public places and at night. Software is freeware. Remote Desktop Control is one of the best remote access software on the market. It is based on Anyplace Control technology. Anyplace starts as a division of ABF in 2003, I've take a serious part in creation of this startup. When I quit ABF, I've arranged agreement to make a "white copy" of Anyplace Control product and call it Remote Desktop Control. Remote Desktop Control software is distributed by AQUATRA company now. Magnifying Tools is a set of useful graphics utilities for viewing the screen area in different zooms. I was an architect of this software product when have been working in ABF. The Launcher application is made by me. Also I've adapted the Lens freeware tool to be a part of this software set. This software set is a commercial product by ABF software, Inc. There is a free evaluation version, so you can download it and test does software fit your requirements before purchasing. 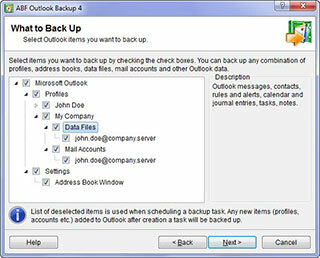 Outlook Backup is a popular backing up solution for Microsoft Office Outlook. I was production and marketing manager of this software (versions 1 and 2) while been working in ABF. You can download and evaluate Outlook Backup software before purchasing. It is a shareware product. Outlook Express Backup was a mainstream software product of ABF company between 2002 and 2007 years. I was an architect, lead developer, product manager, and marketer of this popular backup solution for Outlook Express mail manager. Outlook Express Backup is a try-before-you-buy software. There is an evaluation version, so you can download it and test the program before actual buying. CD Shell is a constructor for fast creating of shells for CD/DVD/BluRay disc or other media. I've created this software for internal usage to make product discs for ABF customers. But then we decide to make a public release of this disc shell builder. Software is distributed as try before you buy from ABF-DEV.COM website. Value Converter was the first end-user software product of ABF software, Inc. This program has no commercial success, but many technologies appeared during development were reused in many software products we did after that. Value Converter software is still popular for many students, technicians, and scientists. You can download and use the trial version during 15 days. We are still good friends with Max Peresada and other members of Torry.net team. That was great times! ABF Visual Components Library is set of more than 60 components and controls for Delphi developers. It was a mainstream product of ABF before entering end-user market. ABF VCL was one of most popular components library on Delphi market till 2007 year. All components and routines are made by me and Dmitry Golovenko. Lens - magnifying glass is a graphic tool for viewing enlarged (2x to 64x) screen area. Actually, this program was created as a demo application of cool looking components for Delphi developers, however, many people with poor eyesight have found this software very helpful. Program is nice assistant for graphic and web designers, software developers and people with partial disability. You can download and use Lens software absolutely free. krpRegions library for Delphi developers was my hobby project even before UtilMind Solutions (before 1999). This library is unique solutions for non-boxed and skinable user interfaces. It is distributed by ABF Software since I've founded the company. Sea Battle is my first game for Windows system created using Borland Delphi language. First version of this software appeared in 1996 and worked even under Windows 3.1! Programming was my hobby in school, institute and while I've been working in computer manufacture industry. The current version of battleship game is 3.0. You can download and play the game absolutely free. Platina is an invoice form filler for Windows 3.x system. Program was used in many commercial firms around all Ukraine. This program made me a well know programmer in some business communities. Kiev Phone software was a standard "de facto" to search people by phone numbers and vice versa. I've created this program when get unofficial database of all Kiev citizens. Find out what are the best Australian pokies. Microsoft®, Windows®, MS, Microsoft Windows, Windows Vista, Windows Server, Microsoft Office, Outlook, Internet Explorer either registered trademarks or trademarks of Microsoft Corporation.